Last night they were cruising low and slow through the Eichler Homes in Granada Hills for a drive thru/walk thru exhibition. 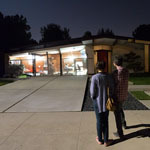 The landmark neighborhood of 1960’s modernist homes was turned inside out by filmmaker Nate Page, who projected films of the hidden interiors of the mid century marvels onto the exteriors of the houses. Dogs, babies, and beaming owners strolled the streets exploring the secret suburbs. In the videos, a man played a guitar on his sofa, a dog chewed a bone, and in one that I participated in (and had technical difficulties) a dinner party and piano sing-along unfolded among the sleek furnishings. Reversing the perspective opened up the neighborhood and created a temporary community that came together for the night. I drove by a pedestrian and told him it reminded me of seeing Christmas lights, he thought it was more like Halloween. It was all those things, and the 4th of July. I wish it lasted all year long. Let’s hope Machine Project and the Getty Museum team up again sometime soon.